Gregory Poole is the premier Blue Bird and Micro Bird bus dealer for the entire state of North Carolina. With over 85 years experience in manufacturing purpose built school buses and activity buses, customers have always counted on Blue Bird and Micro Bird to deliver buses that represent quality, dependability, and reliability. Now, you can count on Gregory Poole for the best product support in the business. Backed by the best dealership network in the world, Gregory Poole has been in business for over 60 years and is considered the industry leader in providing superior customer service…unparalleled product support and technical expertise! Blue Bird and Micro Bird offer many commercial buses to meet your shuttle, transit, charter, para-transit, or specialty vehicle needs. Blue Bird and Micro Bird build one of the safest buses in the world and offer many models to meet your day care and/or child care transportation needs. All buses are built to the Federal Motor Vehicle Safety Standard (FMVSS) school bus construction standards and represent the very best in safety, quality, and dependability. 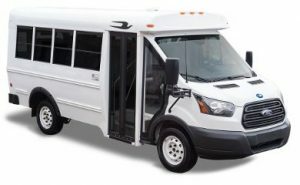 Blue Bird and Micro Bird offer many bus models to meet your transit, para-transit, or specialty vehicle needs. All retirement and assisted living buses come with a variety of seating configurations and wheelchair lift options. America’s most popular alternative fuel brand, with over 3,500 sold to date. Blue Bird is the only manufacturer offering a complete line of buses powered by alternative fuels, such as propane and compressed natural gas. Alternative fuel solutions offer the lowest fuel and maintenance costs, while providing best in class performance. In addition to offering the best selection of buses for sale in North Carolina, Gregory Poole also offers comprehensive service and support to keep your vehicle running for years to come. Our full-service facilities include 40 bays and 25 technicians working in Garner, Mebane and Fayetteville. As your exclusive supplier of Bluebird buses for sale in NC, we are able to offer comprehensive warranty service as well as a full selection of replacement parts and accessories. With flexible financing options from Gregory Poole, it’s easier than ever to shop our great selection of buses for sale in North Carolina. We offer several convenient credit options and can help you select the plan that is most appropriate for your business. Since 1951, we have been the premier supplier of purpose-built buses in North Carolina, and our sales team has the resources and experience to help you grow your fleet responsibly. Contact Gregory Poole today for more information.